Shaklee’s anti-aging products are the best on the market in our opinion. But first, let’s take a step back and take a look at anti-aging science. Watch this Ted Talks video that explains the medical findings of resveratrol’s ability essentially “starve” tumor cells. When you have medical doctors recognizing how we can fight disease by preventing the development and growth of tumors through natural anti-aging supplements…you know we’re onto something. The discovery of resveratrol has provided us with an incredible way to fight cellular aging. It inhibits androgenesis by 60%. WOW! Science is great, but how does it apply to you? Well, Shaklee has teamed up with leading scientists to develop a patented blend of both resveratrol and a proprietary phytonutrient blend that captures the magnificent antioxidant properties of muscadine grapes. This anti-aging solution has been shown to be 10X more effective than just resveratrol by itself at slowing celluar aging. This incredible anti-aging product is Vivix®. In our opinion, it is the world’s best anti-aging product. It’s a fully natural, organic, cell-repairing supplement that tastes great, gives you a boost of energy and helps keep your body safe from environmental toxins. Your cells’ built-in defense mechanisms are compromised by things like daily stress, fast food, lack of exercise and toxins in our environment. As a result, you have lower energy and your DNA is actually being damaged. Yep…it’s bad. This is how celluar aging happens. Clinical and laboratory studies† show that Vivix® ingredients have a positive impact on a few key parts of the cellular aging process. Let’s dive in. Cellular Defense – A clinical study† has shown that the anti-aging ingredients in Vivix are capable of thwarting our body’s negative response to stress. As we all know, stress is bad…it ages us. Cellular Energy – A scientific lab study† has shown that the anti-aging ingredients in Vivix are capable of increasing cellular energy production, which deteriorates over time. Now that is cool. Cellular Repair – Multiple lab studies† have shown that the anti-aging ingredients in Vivix has the power to both protect and repair our DNA. This is incredible. Cellular Performance – This one’s awesome. Even more sophisticated lab studies† by the Shaklee science partners have shown that the powerful antioxidants in Vivix actually activated a genetic regulator in our body that assists in improving cellular performance…and it even thwarts the formation of AGE proteins, which cause damage to our cells. † Study name: A Resveratrol and Polyphenol Preparation Suppresses Oxidative and Inflammatory Response to a High-Fat, High-Carbohydrate Meal. Date published: February 2, 2011. You can read it here if you really want to. Cellular aging protection from more than 15 polyphenols, such ellagitannins (yeah, complicated word)…which is quite simply one of the most potent natural antioxidants on earth. A 10X higher potency than other anti-aging products that focus solely on resveratrol…which is great by itself, but much more powerful with polyphenols. Easy to consume and digest without artificially flavored badness that could add more gunk to your body. It’s pure reseveratrol mixed with poweful polyphenols, baby. Vivix® is the reason why Nancy wants to share her story with other people. Watch Nancy’s Shaklee Effect to learn more about her experience. Where to Buy This Incredible Anti-Aging Product? 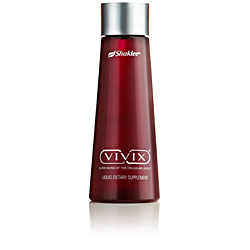 Vivix, like all Shaklee products, are sold through distributors like us. Click below to order any of these anti-aging products from Shaklee. Have Questions About Shaklee’s Anti-Aging Products? We are always happy to build relationships and help support you in your anti-aging efforts. Fill out this quick contact form and we’ll get right back to you to discuss your path to a longer life.